Who doesn’t want soft, youthful and vibrant skin? 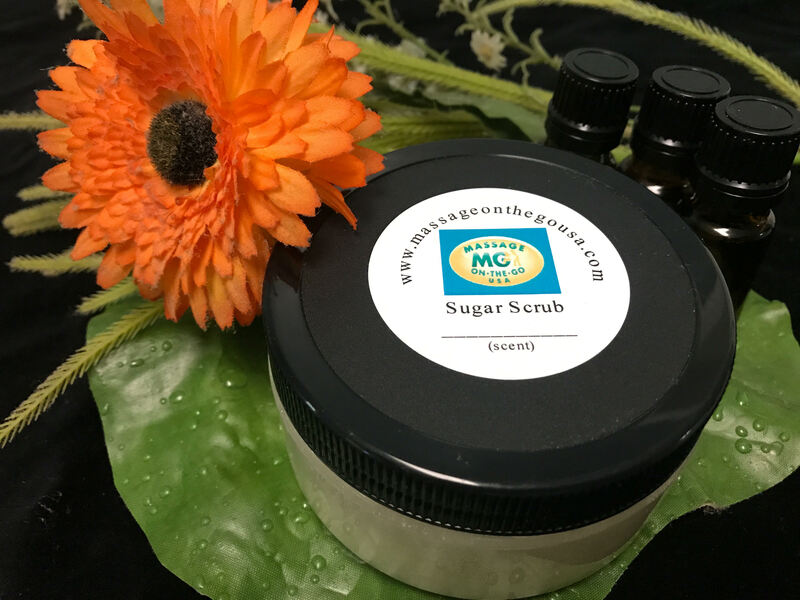 Our Aromatherapy Sugar Scrub Craft Kits allow you to create your very own, all natural sugar scrub designed to meet your specific needs. Sugar scrubs are wonderful for exfoliating and rejuvenating skin without the drying effects some cleansers have. These all natural scrubs provide gentle abrasion to remove skin damaged by everyday exposure to dirt, pollution and the sun. The use of all natural ingredients in our sugar scrub kits allows the sugar scrubs to be used for the entire body. Sugar scrubs can be used whether you are looking to sooth chapped lips or get rid of tough calluses on your feet. Soft, smooth skin is not the only benefit of using sugar scrubs, the gentle massage of a sugar scrub can enhance blood flow and allow more oxygen to get to the skin cells helping to alleviate some common skin ailments. Massage on the Go USA’s Aromatherapy Sugar Scrubs use a unique blend of pure organic oils rich in beta-carotene, and vitamin D, C & E. Our oil has been shown to reduce the visibility of scars and as an anti-inflammatory. Our oil moisturizes skin without leaving an oily residue and can be used to balance both oily or dry patches on the skin. Along with the benefits of the sugar and moisturizing oil, we also provide specific aromatherapy oils to provide an extra boost to your sugar scrub. Our kits include 3 aromatherapy oils so that you can customize your sugar scrub to meet your specific needs.We can provide aromatherapy to aid in relaxation, revitalization and can help balance moods. Massage on the Go USA provides recommendations so you can customize your sugar scrub to your desires. *To keep shipping costs down the sugar scrub kits is the only kits we do not supply everything. The only thing you need to provide is the sugar. Based on the number of kits you want we will let you know how much sugar you would need to have on hand.